What had happened here? Had the client and consultant produced a document with terrific “thump appeal” (nice and heavy, over 100 pages long and beautifully bound) but with no practical application? All too often, strategic technology plans gather dust on some obscure shelf, without long-term or real-world value. Is strategic technology planning little more than an expensive and time-consuming exercise, “full of sound and fury, signifying nothing?” Or can such planning become a useful process, creating a technology guide for creatively and cost-effectively leading educational institutions into the Information Age? The demand for strategic technology planning is clearly growing. For example, one mid-Atlantic state recently made $50M in technology grant money available to the state colleges and universities. Two catches: It’s a matching grant, and applications for the grants must include a strategic technology plan. In another example, in Massachusetts, city and town school systems are required to have a technology plan in place in order to receive state educational funding. Most of them do (although few, if any, are actually adhering to their plans). there are many horror stories of poorly planned, stranded, or wasted implementations. With these powerful drivers at work, top administrators send the loud and clear message to technology directors: “We need a PLAN!” Technology directors do their best to comply. Yet in spite of this demand, the potential benefit to the institution, and everyone’s best efforts, strategic technology plans frequently fail to provide much of tangible value, particularly if they aren’t implemented. How, then, do the institution and technology directors gain the most value from the time, effort and money that is expended during the planning process? The good news is that technology planning can be beneficial to technologists and to the institution as a whole. This benefit is only realized, however, if the institution is clear about what a strategic technology plan should be and cannot be; if the planning process is done effectively; if the plan is incorporated into the institutional decision-making process; and if the plan becomes a living document. Technology directors who understand the planning process and their role in it can help design and facilitate the development of a strategic technology plan, i.e., a comprehensive, high level plan that is based on institutional goals and on trends in technology and education. On a less positive note, directors who are asked to develop a strategic plan but who do not understand how to do so or what is at stake will probably be frustrated and could even find themselves job hunting at the end of the process. The Strategic Technology Plan – Concept or Blueprint? 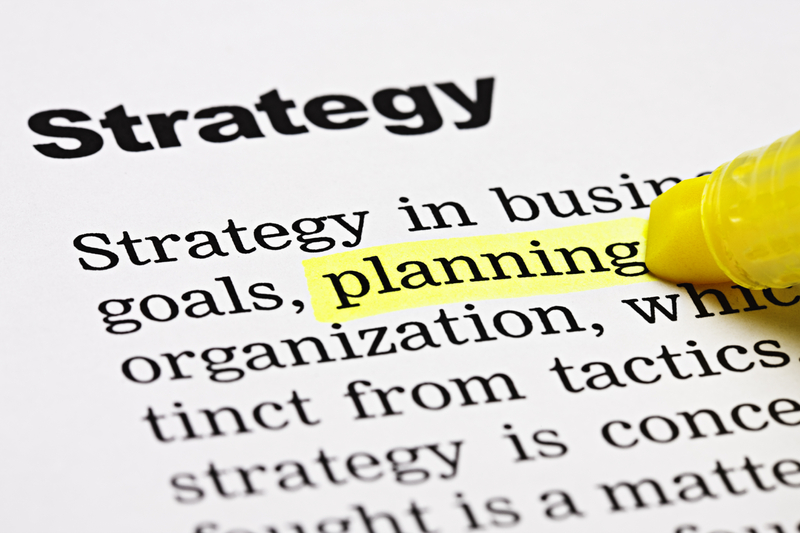 Strategic technology plans often fail because they are in fact tactical technology plans. Too often they are full of project details like specific technologies to be used, capital and operational costs, and timeframes. Filled with this detail, they make a powerful case for following a particular technology path. The client described above wanted a blueprint – a structured, itemized, and priced shopping list of technology projects to be implemented over the next five years. Though the client called it a strategic plan, essentially it got what it sought: a five year tactical plan. Unfortunately for the client and for many planners, factors even more powerful than the plan (availability of funding, unanticipated needs, politics, etc.) often determine the direction of technology on campus, making the detailed plan itself little more than a frustrating reminder of what might have been (if only “they” had listened!). What works well for a tactical plan – technology-driven, results-oriented, and focused – is “three strikes, you’re out!” for a strategic plan. Any plan that is truly strategic focuses on issues, on goals, on institution-wide challenges and opportunities. It should be a conceptual document, a big picture design based on institutional needs and priorities. The planning process needs a good designer who starts with questions such as: What are you (the institution) trying to accomplish? What problems are you trying to solve? How do your overall goals and priorities fit together? What are the major forces influencing your design decisions? Answering these questions is the crucial first step of the strategic planning process, leading eventually to the formal articulation of the institution’s mission and goals. Ideally, the technology director will have input into this process, though usually much of the work and most of the decisions take place at the highest levels of the institution. Having established the institution’s overall strategic plan, the next step is to develop a comprehensive technology plan. A big picture, integrated approach to all campus technologies becomes an invaluable guide for implementing technology in an intentional, intelligent and cost-effective manner. This is where technology directors can play the vital role of designer that we described above; they should ask the same fundamental questions of the institution, only this time from a technological perspective. Further, directors are uniquely qualified to fashion their institution’s answers to these questions, together with their overall understanding of campus technology and the technology industry, into a meaningful, do-able long range plan. The methodology for developing this kind of plan is described in the next section. The challenge for many technology directors is to keep their eyes on the concepts instead of focusing exclusively on tactical issues. Technologists are usually detail oriented. Concentrating on keeping the day-to-day operations running smoothly can make strategic thinking difficult. Yet the fact remains that the technology director must see the forest while living amongst the trees in order to create a meaningful technology plan. Perhaps the most valuable benefit to come out of the technology planning process is the process itself. The plan may never be fully implemented – sometimes it never even gets read. But the planning process can be of great value to technology directors and to institutions, even if the final implementation is limited. This planning process provides an opportunity to assess where technology at the institution stands now and to identify needs and new requirements. Perhaps most importantly, it gives everyone a chance to participate in the implementation and operation of campus technologies. Invariably, people are much more willing to embrace technological change if they feel their needs have been heard and responded to. The process, at its best, also fosters communication between various departments, creating opportunities for sharing knowledge and resources in new, synergistic ways. For example, technology users frequently express a common frustration with technology support on campus: they don’t know whom to call for what, their calls are not returned, the left hand doesn’t know what the right hand is doing, etc. It usually turns out that the technology support people share the same frustration! As a result of this discovery, many institutions begin moving to an integrated help desk for all technology problems, a one-stop shopping center for all technological problems and concerns. The process of getting the right people talking about these kinds of issues at the right time can lead to improved efficiency, not to mention happier support staff and users. Finally, the planning process is a means to develop, adopt, and implement technology standards and priorities. Without these standards and priorities, anything goes, and there is little hope of limiting the technology that can and will be purchased and supported at the institution. The technology director has little recourse other than fixing the TRS-80 on the professor’s desk or servicing the 1A2 key system in the admissions office. Will the new distance learning system be compatible with the data network? Will the telemanagement system talk to the general ledger? Which project gets done first? Trying to be all things technological to all people is typically futile and inevitably expensive. Through the strategic planning process, people come to understand and accept the limits on time, money and expertise. They see the value in saying “no” or “not now” to some projects for the greater good. Institution-wide consensus on standards and priorities is a powerful tool for the technology director, and this tool is most effectively forged in the strategic planning process. the production of the formal technology plan. This planning methodology can be employed by technology directors for planning at both the strategic level, as described previously, and at the tactical level, which we discuss next. Once the overall basic design questions are addressed at the conceptual level, high level tactical plans, the specific blueprints of how the design is to be executed, can be prepared for implementation. The development of a reliable, stable, flexible, and manageable technology infrastructure is the single best long term technology investment an institution can make. Indeed, such an infrastructure makes all technologies possible; the lack of such an infrastructure can stop any technology implementation in its tracks. It is the responsibility of the technology director to facilitate the planning and implementation of this critical technology component. flexibility to easily adapt to changes in media, topology or approach. This is as far as this high level tactical planning should go. Designating protocols, hubs and routers, servers, desktop devices, etc., is best done on an as-needed basis by the institution’s technology staff, based on the infrastructure design and established technology standards. The greatest value of a comprehensive technology plan, be it tactical or strategic, is realized when the plan is used to influence how institutional resources are allocated. In other words, the projects, goals and priorities of the plan must be part of the equation when the institution decides where to spend the money. It is vital that the budgeting process include participants in the strategic technology planning process (technology directors and others) who are intimately familiar with the plan and its goals. One reason that the client described earlier did not follow its own strategic plan is that the people who made the dollar decisions at the institution hardly knew the plan existed, let alone that the plan should influence capital expenditure allocations. The planners must insist that the plan be considered as part of the capital budgeting process. The director should also develop pilot projects to test the feasibility of particular technologies and then use the results of these projects as a springboard to full scale implementation. Decision makers who don’t really understand a given technology are much more likely to fund a small- scale project than to commit whole-hog to an untried solution. Once the value of the technology has been proven, more money usually follows. Like a shark, if a strategic plan does not keep moving and changing, it is of little long-term value; in effect, it dies. The strategic technology plan must become a “living document,” ever- responsive to changes in the institution’s mission and goals, to new developments in technology, and to major trends in the educational marketplace. The distance learning phenomenon that is sweeping across higher education is a prime example of the need for technology plans to be flexible, living documents. Not that long ago, distance learning meant correspondence courses and closed circuit broadcasts (on-campus only). The confluence of a changing educational marketplace (e.g., the life-long learner) and technological innovations (ISDN and video conferencing; cheaper, faster, better electronics; the web; etc.) has led many institutions to revise their academic mission. Technology plans that were fixed on the previous mission, on “old” technologies and on the marketplace of yesteryear, required wholesale rewriting in order to be responsive to this educational evolution. To be effective and valuable long term, the strategic technology plan must address how on- going changes will be assessed and adopted. Written into the plan should be formal mechanisms for regular re-evaluation of the plan and its current relevance vis-a-vis the institution and the technology industry. These mechanisms can include technology advisory committees, peer review by other similar institutions, annual plan review meetings attended by the original planners, surveys and questionnaires (on- and off-campus), etc. The technology director should continue to play the key role of designer, making sure the right questions are asked and modifying the strategic technology plan based on the answers to those questions. So when the cry goes out, “We need a PLAN!”, technology directors should willingly accept the challenge, knowing that the planning process can be valuable for them and for the institution. Proper strategic technology planning is crucial if the institution is to implement its technology responsively and responsibly. It is also a high profile opportunity for technology directors, working as designers and facilitators, to shape the future of technology at their institution. This post was co-authored by Scott Street, Associate VP for Information Technology at Berklee College of Music in Boston, MA, sstreet@berklee.edu. Geoff Tritsch can be reached at geoffrey.tritsch@vantagetcg.com.